Fits so well you’ll forget that you’re wearing them! Orange Heavy Duty Nitrile Gloves should be in every car guy’s garage - PERIOD! These heavy duty latex-free gloves protect your hands from common chemicals found inside the garage, including but not limited to grease, engine cleaners, pesticides, detergents, and more! 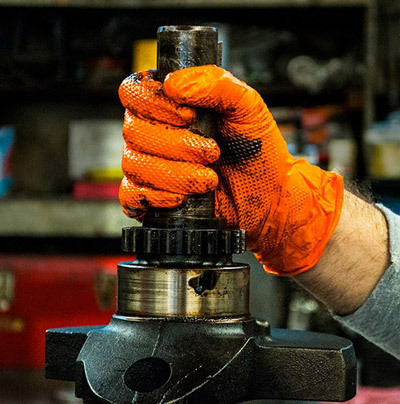 Orange Heavy Duty Nitrile Gloves are tear and puncture resistant, making them the ideal choice for the enthusiast that turns wrenches and performs their own vehicle maintenance. Strong enough for any job! Orange Heavy Duty Nitrile Gloves fit and feel like a 7 mil glove, yet they have the strength of a 10 mil glove. This ensures complete and total protection from all the things car guys encounter as they change their own oil, replace spark plugs, rebuild a motor, and much, much more! It’s only an added bonus that Orange Heavy Duty Nitrile Gloves fit like…well….a glove! Orange Heavy Duty Nitrile Gloves feature a true raised diamond texture that increases grip strength in wet or dry conditions. The bright orange color is easy to spot while working inside dark garages and engine compartments. What’s more, the fingertips are thicker than the rest of the glove, providing increased levels of protection. Orange Heavy Duty Nitrile Gloves are latex and powder free, making them perfect for those with latex sensitivity. The inside of Orange Heavy Duty Nitrile Gloves is lined with a polymer coating that makes them easy to remove. What more could you ask for in a glove?! Orange Heavy Duty Nitrile Gloves protect your skin, keep your hands clean, and increase your grip strength. Performing your own vehicle maintenance has never been this easy!